I started collecting art around 15 years ago after a visit to my own town Whitby, on the north east coast of Yorkshire after a visit to an art gallery in the old part of the town, just over the bridge approaching the famous 199 steps. If you do visit Whitby and are interested in Art there are a couple of galleries within 20 meters of each other. The one that started my collection was Whitby Galleries. My first purchase was of a Northern Artist, Barry Hilton and since my first visit I have purchased 5 originals from Barry Hilton. These are street scenes and Galleons in a harbour setting, but nowadays Barry Hilton is more known for country and beach scenes. Born in Manchester in 1941, artist Barry Hilton moved to Cornwall in 1979, a period of his life that has had a profound influence on the remainder of his artistic career. 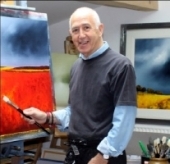 Barry Hilton states that painting and drawing have always played a crucial role in his life. Despite no formal training, Barry Hilton had the experience of working alongside a group of extremely active artists in Cornwall, which helped in the development of his artistic abilities. Under the guidance of Mr Leonard Rollason, known in the art trade as “Rolli,” Barry Hilton was mentored and it was this period which saw the birth of Barry Hilton’s professional career. Barry Hilton’s is a story of continuing development – he was told that “selling and success are synonymous” – should this be true, then he can certainly be called “successful”. Barry Hilton captures his love of nostalgia exquisitely in his paintings of Gas Lit streets and marine galleon scenes. These are much sought after and are well represented in private galleries throughout the UK. Refusing to be stereotyped, Barry Hilton continues to experiment with new subject matter. He has recently had considerable success with beach scenes, still life and his dramatic contemporary landscapes. These series of paintings exude an atmospheric quality which is unique to his work and have helped to maintain Barry Hilton’s place as one of the UK’s best selling artists..
Having proudly reached the milestone of 70, Barry Hilton is still developing his style and technique and working hard to satisfy his army of art collectors around the world. I waited sometime due to the lack of space to hang the paintings for the right setting to expand on my collection and eventually found the right setting in the house that I now live. Since that day I started purchasing Ashley Jackson art. Ashley Jackson is a well know artist who had a TV series a number of years ago and who’s Gallery is in the beautiful town of Holmfirth famous for the Last Of The Summer Wine TV show. Which aired from 1973 through to 2010. 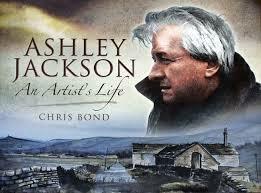 Ashley Jackson, has had an extremely distinctive and illustrious life in the world of art. Since opening his first gallery back in 1963, he has become one of the country’s leading and most successful landscape watercolorists. Ashley Jackson’s unique, evocative and distinctive paintings of brooding moorlands have become synonymous with Yorkshire, and more particular the moors above and around his Gallery situated in the heart of the Pennines, Holmfirth. Ashley Jackson has had his work exhibited throughout the world, and adorn the walls of many successful and famous people, from politicians to actors, from Tsars to Princes. Ashley Jackson was honoured when the former President of America, Bill Clinton, an avid art collector was presented with an original watercolour. Ashley Jackson, throughout his career has always been an ambassador for the arts. He has strived, through his life to encourage people not just to take up art, but to appreciate the beauty of the landscape around us. Ashley Jackson has spent many weekends painting with Prince Charles as he is an established painter and rates William Turner as a main inspiration. Ashley Jackson’s gallery in Holmfirth. Downstairs is where you can purchase prints and other items. the upstairs area you have to make an appointment because this is where Ashley Jackson displays his original paintings. Well worth a visit!